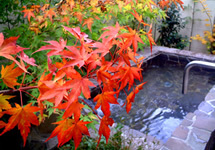 We will serve you with relaxing atmosphere, which is surrounded by seasonal colorful view and open-air bath. This is like a nostalgic Japanese days. 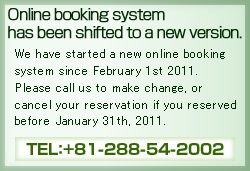 <<< Meals will be served at the compartment style restaurant, or regular restaurant. *Not served at your guestroom. 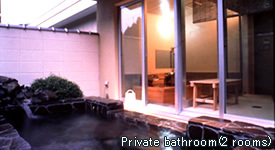 The private bathroom is open for 50 minutes each guest, but it is required additional 2100yen. Day trippers are welcome to bathing, but in between 15:00 and 18:00. *1,050yen for day trippers' bathing. 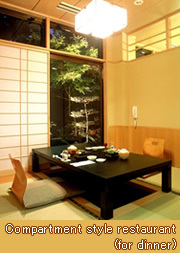 We serve with theme on the Japanese early times, and aim to serve simple, but heart warming hospitality. We will serve you with a cup of plum tea and fortune slip, when you check in. Also, candies or cookies are ready at your guestroom. These little sweets are something nostalgic because Japanese adults used to have it in their childhood. Copyrightc2009 Natsukashiya Fuwari. All rights reserved.